Broadcast Education Association (BEA) Conference: The Image of the Broadcast Journaist in Popular Culture Panel, April 19, 2016, 9 to 10:15 a.m. The Image of the Broadcast Journalist in Popular Culture panel will be presented at the BEA Conference on Tuesday, April 19, 9 to 10:15 a.m. at the Las Vegas Westgate, moderated by Joe Saltzman, IJPC Director, and featuring panelists Matthew C. Ehrlich, University of Illinois at Urbana-Champaign and Sammye Johnson, Trinity University. The image of the broadcast journalist in popular culture is one that builds on the worst characteristics of real-life TV journalists seen on live television news and exaggerates that portrayal into one of the most ridiculed figures in journalism today. Of all the images of the journalists in popular culture the broadcast journalist is the most negatively portrayed. The panel explores why this is true. A seven-minute video will be shown showing samples of the images of broadcast journalists in movies and television programs. Joe Saltzman is a guest speaker at the National Broadcasting Society-Alpha Epsilon Rho on Tuesday, March 25, 2016 at 9 a.m.
A pre-conference workshop at the AEJMC 2015 Conference in San Francisco on Wednesday, August 5, 2015 from 1 p.m. to 5 p.m: “Honoring the Career of Joe Saltzman: Journalist, Teacher, Mentor, and Pioneer"
Matthew C. Ehrlich presented a paper on Journalism History in Popular Culture at the International Communication Association in London, England in June, 2013. Ehrlich wrote that a growing scholarly literature has highlighted the important role that popular culture plays in shaping the public's thinking about the past. His paper looks specifically at the ways in which popular culture depicts journalism history. The focus is on two eras of American press history that have received sustained scholarly attention and that pop culture has also regularly addressed: the early decades of modern journalism from roughly 1890-1940, and the age of so-called high modernism from roughly 1945-1980. Popular culture employs scrupulous attention to historical detail alongside wholesale invention in both mythologizing and demythologizing journalism's past. That is, it shamelessly exalts figures and events that conventional journalism histories have celebrated. At the same it, it casts a skeptical and even mocking eye toward those same figures and events, and it highlights less heroic aspects of journalism's past that the conventional histories have sometimes downplayed or overlooked. 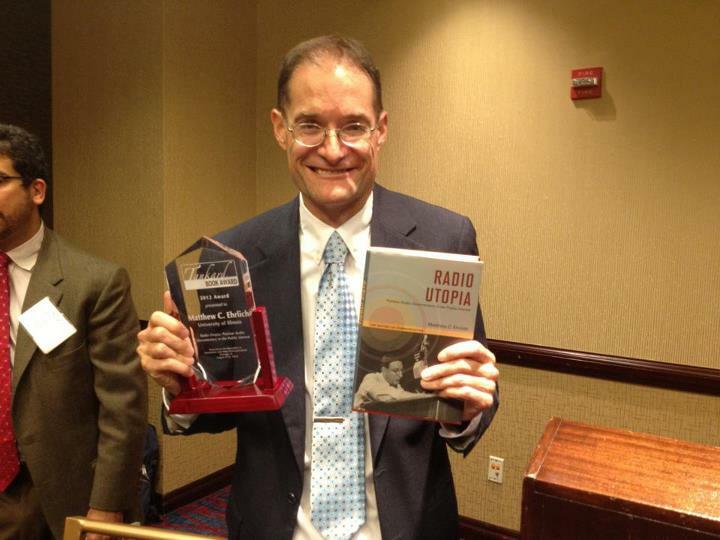 Matthew Ehrlich, Professor of Journalism at the University of Illinois and IJPC Associate Director, won the coveted 2012 James tankard Book Award for Radio Utopia, which was presented at the AEJMC Conference in Chicago in August, 2012. Ehrlich and Joe Saltzman, USC Annenberg and IJPC Director, represented the IJPC at the conference. Joe Saltzman, the director of The Image of the Journalist in Popular Culture (IJPC) Project, presented a paper describing his research on "The Image of the Public Relations Practitioner in Movies and Television, 1901-2011" at the International History of Public Relations Conference on July 11-12, 2012 at Bournemouth University in Great Britain. Joe Saltzman, the director of The Image of the Journalist in Popular Culture (IJPC) Project, was named the 2010 AEJMC-Scripps Howard national Journalism & Mass Communication Teacher of the Year. He and the IJPC were involved in a series of events at this year's AEJMC conference. IJPC Director Saltzman moderated “The Image of the Public Relations Practitioner in Popular Culture,” on Tuesday, August 9, 2011 in a pre-conference panel from 2 p.m. to 5 p.m. presented by the Public Relations Division and Entertainment Studies Interest Group. This pre-conference explored the image of the public relations practitioner in the movies, television, fiction and other aspects of popular culture, discovering ways to improve that image. In the first part of the session panelists discussed research indicating the image of the publicist and the public relations professional is one of the most negative in history. In the second part of the session, Image Repair, panelists and participants discussed how to repair that image. Moderator-Discussant Saltzman presented a preview of a 2011 IJPC Video, “The Image of the Public Relations Practitioner in Movies and Television, 1901-2011.” Panelists included Carol Ames of the California State University at Fullerton who talked about the image of the public relations practitioner in movies; Emily Kinsky of Pepperdine University discussed the image of the public relations practitioner in television, and Karen Miller Russell of the University of Georgia discussed the image of the public relations practitioner in fiction. Saltzman was at the USC Annenberg booth in the Majestic Ballroom promoting the most ambitious IJPC project to date, a 3 dual-layer DVD-set, nearly 12-hour video compilation, “The Image of the Public Relations Practitioner in Movies and Television, 1901-2011,” and soliciting manuscripts for the third edition of the peer-review The IJPC Journal. Saltzman, the 2010 national journalism and communications Teacher of the Year then joined four other AEJMC-Scripps Howard Foundation Teachers of the Year in a panel, “How Our Teachers of the Year Make Journalism Education Riveting and Relevant,” on Friday, August 12, 1:45-3:15 p.m. The panelists shared best practices for journalism instruction. Offering tweet-worthy tips and syllabus-changing insight were Chris Roush, Hussman Distinguished Scholar in Business Journalism and director of the Carolina Business News Initiative, University of North Carolina at Chapel Hill; Charles Davis, associate professor of journalism studies, Missouri School of Journalism; Sandra Chance, Esq., McClatchy Professor of Freedom of Information and executive director of the Brechner Center for Freedom of Information, University of Florida; Deb Aikat, associate professor and media futurist, University of North Carolina at Chapel Hill. (Scripps Howard Foundation and AEJMC Council of Affiliates), and Saltzman. Saltzman also discussed the Image of the Journalist in Popular Culture project at the USC Annenberg Breakfast, on Friday, August 12, 2011 at 8:30 a.m. He showed a brief video summing up the images of the journalists in movies and television. IJPC Director Joe Saltzman presented Herodotus As An Ancient Journalist: Reimagining Antiquity's Historians as Journalists at a scholar-to-scholar History Division Refereed Paper Post Session on Friday, August 6, 2010. Joe Saltzman, University of Southern California, presented his research on the image of the gay journalist in popular culture, November 16, 2009 in the Geoffrey Cowan Forum (Annenberg Room 207), 12 noon. featured a panel, "The Image of the Gay Journalist in Popular Culture," sponsored by The Gay, Lesbian, Bisexual and Transgender group at 2 to 3:15 p.m., Thursday, November 12 in conjunction with one of the convention's themes "Being Gay, Lesbian, Bisexual, Transgendered, or Queer in Today's Society." Panelists included Gary Hicks, Associate Professor, Southern Illinois University-Edwardsville, Matthew Ehrlich, Professor, University of Illinois, and Sammye Johnson, Professor, Trinity University. A 14-minute excerpt of The Image of the Gay Journalist in Movies and Television, 1929-2009 produced by Joe Saltzman professor of journalism at USC Annenberg was shown. featured a PF&R Panel "The Image of the Gay Journalist in Popular Culture" sponsored by the Entertainment Studies Interest Group and The Gay, Lesbian, Bisexual and Transgender Interest Group at 10 to 11:30 a.m., Wednesday, August 5, 2009. Western States Communication Association (WSCA) Convention, February 13-17, 2009 featured a panel on "Metaphorical Images of War: Weaving Perspectives of History, Gender and Popular Culture" chaired by IJPC Associate David Natharius, adjunct professor, Walter Cronkite School of Journalism and Mass Communication, Arizona State University. The panel explored three diverse sources of images about war and the women and men war journalists who create the enduring stories of war. Carol Schwalbe and Bill Silcock of Arizona State University presented "War Images Past and Present: A Brief History of Controversial Images from the American Civil War to Iraq"; IJPC Director Joe Saltzman from USC Annenberg discussed"Depiction of the War Journalist in Movies and Television from the Image of the Journalist in Popular Culture (IJPC) Project," a presentation that will include a video; Sammye Johnson, Trinity University and co-founding editor of The IJPC Journal, shared her research on "The Female War Journalist in Popular Novels: Glamour, Grit and Guts." The Columbia University Alumni Association of Southern California held a special event called Hollywood and Journalists featuring IJPC Director and Columbia Graduate School of Journalism Alumnus Joe Saltzman and Bill Grueskin, dean of academic affairs at the School of Journalism, on January 27, 2009 at 6 p.m. at The Jonathan Club in Santa Monica. Saltzman, a recipient of the Columbia Graduate School of Journalism Alumni Award, screened a 35-minute video, “Hollywood and the News: The Image of the Journalist in Film and Television, 1925 to 2007,” and discussed his research on "Hollywood and Journalists.". featured a PF&R Panel sponsored by the Entertainment Studies Interest Group and the Magazine Division on “The Image of the War Correspondent in Popular Culture,” at 11:45 a.m., Thursday, August 7, 2008. THE ASSOCIATION FOR EDUCATION IN JOURNALISM AND MASS COMMUNICATION (AEJMC) in Washington, D.C.
IJPC Director Joe Saltzman spoke on “The Image of the Journalist in Popular Culture” in the Low Library Faculty Room at 11 a.m., Saturday, April 21. Saltzman, Class of ’62 and winner of the 2005 Alumni Award, presented a one-hour version of his popular course at USC's Annenberg School on the portrayal of journalists in movies and television fiction, from crusaders to scoundrels. San Francisco, May 26, 2007 featured a panel on "Gender, Journalism and Popular Culture: The Female Journalist in Film and Television. Radhika E. Parameswaran from Indiana University was the session organizer and chair, and presented "Tabloid News in the Film 'Page Three': Gender, Generation, and the Decline of the Nation." The other panelists were IJPC Associate Director Matthew C. Ehrlich, University of Illinois, who spoke on "Journalism and Gender in "The Devil Wears Prada"; Parameswaran presented ; Berrin Beasley, University of North Florida analyzed "'Pepper Dennis': A Traditional Female Masquerading as a Modern Feminist Journalist," and Mary-Lou Galician, Arizona State University, spoke on "The Return of the Sob Sister in 'Superman Returns': Lois Lane and the Fight for Truth and Justice." The respondent was Bonnie S. Brennen of Temple University. Abstract: Analyses of journalism’s numerous forms in popular culture can give us insights into the boundaries of the profession and the meanings of journalism’s relations with justice, democracy, citizenship, and the social construction of gender. This panel aims to bring together scholars, who in their research on gender and media have taken seriously popular culture’s symbolic portrayal of the contemporary female journalist. Throughout its historical development, journalism’s struggles to define success, professional standards, and best practices have been thoroughly entangled with the cultural meanings of masculinity and femininity. Historical and sociological media research shows that women journalists first faced the challenges of acceptance and then the problems of being perceived as objective, competent, ethical, independent, and entrepreneurial—in short, the model professional. Popular media portrayals of journalism offer a window into a culture’s mythic narratives about female journalists’ successes and failures in the profession. on January 12-15, 2007 included a panel on the Image of the Broadcast Journalist in Movies and Television. Joe Saltzman was the moderator-discussant and will show a 10-minute video, "The Image of the Broadcast Journalist in Movies and Television, 1937-2006." The two other members of the panel were Richard Ness, assistant professor of communication, Western Illinois University and author of “From Headline Hunter to Superman,” the definitive journalism filmography, spoke on “From the Voice in the Dark to the Face in the Crowd: The Rise and Fall of the Radio Film” and Matthew Ehrlich, Professor of Journalism at the University of Illinois and the author of the book, “Journalism in the Movies” discussed the portrayal of Edward R. Murrow and CBS in “Good Night, and Good Luck” showing how the movie was used to comment on what is right and wrong with television news today. THE ASSOCIATION FOR EDUCATION IN JOURNALISM AND MASS COMMUNICATION (AEJMC) in San Francisco, CA. Featured a PF&R Panel sponsored by the Entertainment Studies Interest Group and the Visual Communication Division on the Image of the Broadcast Journalist in Movies and Television 10 a.m. Wednesday, August 2, 2006. Joe Saltzman was the moderator-discussant and produced a 10-minute video, "The Image of the Broadcast Journalist in Movies and Television, 1937-2006." June 28-30, 2006. Joe Saltzman was the featured guest speaker on the Image of the Journalist in Popular Culture. Included in the presentation was a 32-minute video, "Hollywood Looks at the News, 1925 to 2006. June 17, 2006. Joe Saltzman, director of the IJPC, delivered the keynote speech on "The Images of the Journalist in Popular Culture and Their Impact on the Public, the Media and American Democracy." April 13, 14 and 15 2006 at The American University in Cairo, The Prince Alwaleed Bin Talal Bin Abdulaziz Alsaud Center for American Studies & Research featured IJPC Associate Matthew C. Ehrlich, associate professor of journalism at the University of Illinois, author of Journalism Goes to the Movies. The conference was inspired by the IJPC Web site and featured such topics such as "Media's Role in America's 'Culture Wars" (Good Night, and Good Luck), "How American Newsroom Politics Affect Public Perceptions," (Broadcast News), "The Journalist as Celebrity" (Capote), and "The Business of American News" (The Insider). "Hollywood Looks at the News: The Image of the Journalist in Popular Culture," presentation by IJPC Director and USC Annenberg Professor of Journalism Joe Saltzman of the Norman Lear Center on Thursday, Oct. 6, 2005, 4 to 5 p.m. ASC 207.
in San Antonio, Texas, August 12, 2005, Joe Saltzman, IJPC Director and USC Annenberg Professor of Journalism presented a paper during a scholar-to-scholar research session in the AEJMC History Division. at the University of Wales, March 31-April 1, 2005 at Gregynog, Wales: "Approaches to media history: Journalists." IJPC Director Joe Saltzman, USC Annenberg, USA presented his paper, "Analysing the Image of the Journalist in Popular Culture: A Unique Method of Studying Media and their influence on the Public's Perception of its News Media and Journalists." in San Antonio, Texas, 8:15 a.m. Wednesday, August 10, 2005. A PF&R Panel sponsored by the Entertainment Studies Interest Group and the Visual Communication Division on the Image of the Journalist in Popular Culture: Real-Life Journalists as Depicted in Film and Television. Moderator-Discussant: ESIG member Joe Saltzman, Professor of Journalism and Director of the Image of the Journalist in Popular Culture (IJPC), a project of the Norman Lear Center, Annenberg School for Communication, University of Southern California. Producer: 8-minute video on “Real-Life Journalists as Depicted in Film and Television” created especially for AEJMC. "Journalism and Media Culture I: Sob Sisters: The Image of the Female Journalist in Popular Culture,"
March 23-24, 2005, San Diego. The Popular Culture Association panel was moderated by Joe Saltzman, USC Annenberg (Director of the IJPC) who presened an 8-minute video, "Sob Sisters: The Image of the Female Journalist, 1929-2003." Panel members included Richard Ness, Western Illinois University ("Silent Sobs: The Female Reporter in Films of the Pre-Sound Era"); Matthew Ehrlich, Associate Professor of Journalism, University of Illinois ("How Hollywood Gave Jessica Savitch a Happy Ending (Almost)") and Loren Ghiglione, dean of the Medill School of Journalism, Northwestern University ("The Brenda Starrs of the Future"). AEJMC ENTERTAINMENT STUDIES INTEREST GROUP, WINTER NEWSLETTER 2005, Vol. 5, No. 1, Page 2.
featured the NCA First VIce President Panel Discussion, "The Image of the Journalist in Popular Culture," on Friday, November 12, 2004 from 5 p.m. to 6:15 p.m. in Boulevard C., second floor, Chicago Hilton, Chicago. Participants included Dr. Mary-Lou Galician, chair, Arizona State University; Joe Saltzman, USC Annenberg and Director of the IJPC project, Dr. Sammye Johnson, Trinity University, and Dr. David Natharius, Arizona State University. The panel discussed cinematic portrayals of journalists in such films as His Girl Friday and Chicago as well as novels by such diverse writers as Sally Quinn, Edna Buchanan, Danielle Steele, Jackie Collins and Irving Wallace. was a guest scholar-critic at the Locarno International Film Festival in August, 2004 appearing on a panel called "Retrospective: Newsfront -- Reporters, media, scoops and the search for truth. AEJMC 2004 Convention in Toronto, August, 2004. “Sob Sisters: The Image of the Female Journalist in Popular Culture,” a panel sponsored by the Entertainment Studies Interest Group (ESIG) and the Comission on the Status of Women (CSW), was coordinated by Joe Saltzman, director of the IJPC, USC Annenberg, 1:30 p.m. to 3 p.m. Wednesday, August 4 in Room 250 at the Sheraton Centre Toronto Hotel in Canada. March 26-28, 2004 sponsored by the American University School of Communication, AFI, the Newseum and the Washington Post. IJPC Director Joe Saltzman will be a panelist on “Hollywood’s Portrayal of the Media: Fact or Fiction?” on Saturday, March 27 at the American Film Institute from 4:45 p.m. to 5:45 p.m. The panel discussion will take place after a special screening of Shattered Glass. Other panelists include Charles Lane, former editor of The New Republic; Desson Thomson and Rita Kempley, the film critics for the Washington Post, and Nell Minow, author and Chicago Tribune columnist. The panel will be moderated by Margaret Engel of the Newseum. CINEMA STUDIES CONFERENCE IN ATLANTA, MARCH 4, 2004. IJPC Associate Director Richard Ness will be presenting a paper on "Stop the Press, Move the Camera: Tracking Camera Movement in Newspaper Films of the Early Sound Era." He is also chairing a panel, "Film Aesthetics: Putting It All Together in the Frame," from 2 to 3:45 p.m.on March 4. The conference is being held at the Omni CNN Center. in Albuquerque, New Mexico, February, 2004. Joe Saltzman, Director of the IJPC, introduced Sob Sisters: The Image of the Female Journalist in Popular Culture, an introductory essay with a bibliography of 4,500 films, television and radio programs, fiction and other items featuring female journalists from 1700 to 2003 at the Association for Education in Journalism and Mass Communication (AEJMC) 86th Annual Convention in July-August 2003. He also introduced the 2004 edition of The Image of the Journalist in Popular Culture (IJPC) Database© IJPC Database and signed copies of Frank Capra and the Image of the Journalist in American Film at the USC Annenberg AEJMC Exhibit Booth. Saltzman was also the discussant for a referred paper session, "Politics, News and Entertainment: Not-So-Strange Bedfellows," an Entertainment Studies Interest Group panel. He was one of a dozen USC Annenberg faculty who attended the event. featured Joe Saltzman, IJPC director, discussing his book Frank Capra and the Image of the Journalist in Popular Culture, 11:30 a.m. to 2:30 p.m. Thursday, March 13, 2003 at the Faculty Center. at the Annual Holiday Dinner of the Friends of Caltech Libraries (FOCAL) at the Caltech Atheneum on Tuesday, December 10, 2002. Saltzman discussed Frank Capra, a Caltech alumnus, and the Image of the Journalist in American Film. quotes IJPC's Joe Saltzman and Richard Ness in "Can Michael Keaton Solve Media's Image Problem? A New TV movie, 'Live in Baghdad,' Offers Insights Into Journalism, An Often-Maligned Profession in Film. By Staff writer Kim Campbell, Dec. 6, 2002. From the Newsroom to the Screening Room: How Hollywood Covers the News Business, October 11, 2002. "Breaking News" cast members joined award-winning producer Joe Saltzman to discuss TV portrayals of news media professionals on Friday, Oct. 11, 2002 at 3 p.m. in Norris Theatre on the USC campus. in Miami, August 7 to 10, 2002. The IJPC Associates were introduced at the AEJMC convention and a special presentation and signing of the Frank Capra and the Image of the Journalist in American Film was held from 3 to 5 p.m. Friday, August 9, at the USC Annenberg Booth #30. Their Impact on the Public, the Media and the American Democracy Was the Keynote Speech by Joe Saltzman at the Program on the Media and American Democracy, June 14, 2002. NYC's 24-hour News Channel, April 26, 2002. Interview with Joe Saltzman on The Image of the Journalist in Popular Culture (7:23 Video). The Columbia University Graduate School of Journalism displayed and sold copies of Joe Saltzman's Frank Capra and the Image of the Journalist in American Film at a book fair held Reunion Weekend. The book was sold in two locations: the Rotunda of Low Library and the Columbia University Bookstore. On KPCC, FM 89.3, Southern California Public Radio, March 6, 2002. USC Professor and IJPC Director Joe Saltzman joins host Kitty Felde to discuss the results of his first exploration of the image of the journalist in Frank Capra films in this 30-minute radio program. From Sob Sister to Mary Richards—the Changing Image of the Journalist. Joe Saltzman's new book shows how the stereotypes in Frank Capra's popular movies influenced the portrayal of the news media for years to come. By Usha Sutliff.